[Ed: Modern peacekeeping efforts have done little to slow the human appetite for civil war. In fact, the rates of emergence for new civil wars have remained constant in bear markets for the past 150 years. 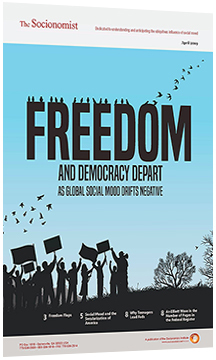 [In this compelling article, Euan Wilson explains that major declines in social mood precipitate outbreaks of civil war. Conventional history tells us that slavery, tariffs, fears about the balance of new slave and free states in the West and states’ rights issues drove the founding of the Confederacy. Historians are quick to refute any issue as the sole cause. Socionomics has its own story to tell, which is that declining social mood exacerbated political issues beyond the reach of compromise. Figure 5 confirms the observation in The Wave Principle of Human Behavior (pg. 266) that the bloodiest wars tend to come after the second of two big declines in social mood. The first decline took place from 1835 to 1842. The second decline, from 1852 to 1859, kindled the fire. Expansion is a bull market trait, and the U.S. had aggressively expanded its borders throughout the first half of the century. Major acquisitions included the Louisiana Purchase (1803) and the Texas Annexation (1845). Social mood peaked in the early 1850s as Southerners defeated their countrymen’s nascent secessionist efforts. But when the trend toward negative mood resumed, the calls for secession grew louder. The Gadsden Purchase (1853), an expansion that was to benefit Southern railroad interests, was smaller than expected, prompting Southerners to howl anew. Declining mood stirred new anger over other old disagreements such as slavery. The Kansas-Nebraska Act of 1854 allowed settlers within the respective new territories to decide the slavery issue for themselves. A year later the slavery question led to “Bleeding Kansas,” the violent border conflict between free-territory Kansas and pro-slave Missouri. The smaller conflict presaged the larger war to come. No National Party can save us; no Sectional Party can do it. But if we could do as our fathers did, organize Committees of Safety all over the cotton states (and it is only in them that we can hope of any effective movement) we shall fire the Southern heart—instruct the Southern mind—give courage to each other, and at the proper moment, by one organized, concerted action, we can precipitate the cotton states into a revolution. The phrases “no party can save us” and “give courage to each other … by one organized, concerted action” display no room for the compromises sought during bull markets. Such antipathy mixed with resolve is a classic expression of negative social mood. In the remainder of this seven-page report, author Euan Wilson examines the social mood environments of the 1936-1939 Spanish Civil War and the 1927-1950 Chinese Civil War, and contrasts these bloody civil wars with the peaceful dissolution of Czechoslovakia in 1993. Wilson also identifies several regions that appear to be at risk of civil war based on their current moods and developments.